Yahoo CEO – Are you serious? Yahoo’s CEO Carol Bartzis is tired of people spouting off about what Yahoo should be doing (or not doing) according to a recent piece in Tech Crunch, so she responds by telling us what Google should be doing. Bartzis’s thinks that Google is on the wrong path by only being in the search business, and I’d totally agree with her if she wasn’t the one on the wrong path. Besides totally disagreeing with her about Google, one has to wonder about this sort of advice coming from the CEO of a company that has changed their mission and strategy more times in the past decade than a club kid changes outfits. Don’t get me wrong, I’m all for a company diversifying, but only if there is a clear and cohesive mission and vision that dictates such a strategy. Yahoo! : To connect people to their passions, communities, and the world’s knowledge. Well done Yahoo. So your mission is as a connector. You are a modern day digital yenta connecting us to knowledge and our passions (I’ll read that as hobbies), and other people. Ok so they’re a search engine and social network. I get it. Much better. While it took Yahoo a bunch of reorganizations and I’m sure lots of meetings and drafts to come up with that mission, Google has remained consistently focused for years on their mission “to organize the world’s information and make it universally accessible and useful,” Whoa, whoa, wait a minute now. Yahoo! Oh no you didn’t! While, Yahoo keeps changing its mission based on the latest digital trends and buzzwords (e.g. portal, content is king, user-generated content), Google has focused on attempting to organize and make accessible the world’s information. While it may seem over ambitious, it gives Google a simple and clear focus and helps them direct their strategy to reach that mission. To put it simply, what better way to organize the world’s information than to ensure you have direct access by all possible means (creating, buying, merging with), products and services in which all that data flows. To take McLuhan’s examples further, IBM sold off their PC division to Lenovo because they understand that products and services are a result of their mission not the mission. 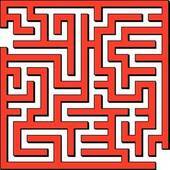 Every product, every acquisition, every merger, every service is a result of the mission not the mission. Skype creator Niklas Zennstrom made headlines recently for proclaiming that all phone calls will be free within 10 years. It’s not be surprising to hear this coming from the creator of a communications software that is offering free calls to landlines and mobile phones to users based in the USA and recently announced a similar program for its French users for free landline and mobile calls in France. But with cable providers, traditional telephone companies, startups like Vonage and Sun Rocket, and just about every two-bit entrepreneur trying to cash-in on the VoIP craze one might question if Zenstrom’s prediction is realizable given the power behind the legacy of making money off of voice calls. That being said, the idea of free phone calls is nothing new and I don’t find the prediction particulaly surprising or groundbreaking. What I do find surprising is that it’s making headlines in 2006 years after I first heard of zero cost phone calls as a grad student at the Interactive Telecommunications Program at NYU in a course called Future of the Infrastructure taught by Art Kleiner. One of Art’s guest speakers brought up the idea of free phone calls to our class as we discussed developing infrastructure in the Global South that was leap-frogging older technology in older developed countries. I don’t remembmer the exact scenario he presented but his ideas stuck with me and I remember his argument was very convincing in support of the global free phone call scenario. If memory serves me he didn’t present a utopian view of free phone calls and we discussed the beneifts and prospective drawbacks such as telephone spam. I recently heard a report on National Public Radio about a town outside of Chicago that has created a new road sign designed to be used in conjunction with the universally recognized stop sign. Officials from Park Ridge, a Chicago suburb, contend that the universally recognized standard stop sign is no longer effective and only serves as an invitation to slow down. 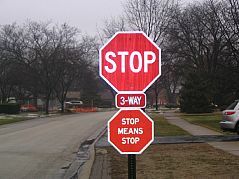 The new sign, also a red octagon, reads “STOP MEANS STOP” and is installed just below the existing stop sign. As a design educator I discuss with my students the responsibility of a designer to ensure a design effectively communicates its targeted message to its audience. We do as much as we possibly can to ensure that the audience or user (in this case driver) knows what to do and how to do it. For this to happen we must first recognize that people are not the same and that an individual comes to a situation with their own knowledge and experience set. To prevent errors, mistakes, and miscommunication it’s the job of the designer to ensure the most effective information design for the maximum numbers of intended users. Given that, you might think that I would support the new Stop Means Stop sign but I don’t. The supplementary stop sign in Park Ridge sets a dangerous precedent and will ultimately dilute the meaning and efficacy of the stop sign. A stop sign means stop. It’s simple, it’s clear, it’s instantly recognizable and the color and shape is employed around the world. Put simply, less is more. By installing a secondary sign in specific locations the meaning of this very simple and clear sign is degraded. The town of Park Ridge is essentially saying “here we really mean it but in places with just one sign we don’t really mean it. As a design strategist I think it’s crucial to evaluate the use, context, and implementation of any design in order to ensure it’s doing what it was created to do. With road signs two things should be effectively communicated; 1) Convey the information on the sign 2) Explain the type/category of sign. There are eight basic road sign types as defined by the Vienna Convention on Road Signs & Signals. This intentional treaty created a simple, organized and very specific system to ensure that road signs are consistent and easily understood. If you ever wondered why stop signs are always red octagons and why highway exit signs are always green you can thank the Vienna Treaty. The problem in Park Ridge is not an issue of conveying the right information it’s an issue of compliance and enforcement. What needs to be communicated is that not stopping will not be tolerated and drivers won’t get away with it. Adding another sign may temporarily draw attention to the sign but in time, if the real problem is not addressed, drivers will most likely ignore the second sign as well as the first one. So is there a solution? You bet. I would suggest that the folks in Park Ridge focus their energies on a solution that addresses the actual problem- enforcement rather than compounding it with over-communication. And if Park Ridge is like many communities and doesn’t have the resources to put traffic cops or patrol cars at every problem intersection, than Perhaps the same community members who have called to complain about drivers not obeying the stop signs could be trained and empowered as community traffic patrollers in a program like Citizens on Patrol with the power to issue citations. This would address the actual problem, involve the community, generate revenue, and likely discourage further violations. Google’s latest beta service, Google Talk is the talk of the town. A quick search on Google News returns several hundred items published in the past 24 hours about Google’s new instant messaging (IM) and voice chat service. But once you get passed the hype and the media frenzy many reviewers are finding Google Talk underwhelming compared to feature rich veteran IM services like AIM and ichat or stable, established free voice chat services like Skype which is used by millions. In response to Google’s move into their territory, Skype has opened its software to encourage developers to incorporate Skype into their own products and services. The new Google Talk service is tied in with Google’s free web mail service G-mail which until this week available only to users who were invited by other users. G-Mail made headlines for its unprecedented free 2 GB of space, its use of the Google search technology to make it easier to find your e-mails. Because G-mail places ads in your messages related to the content of your e-mail, it has stirred concerns among privacy advocates. To get a free G-Mail account users are required to “pay” Google by providing the information aggregator with a mobile phone number where Google will subsequently send an unlock code by text message. While Google promises not to be Evil, many journalists, privacy advocates, and savvy web users are beginning to wonder how much information is too much information for the data aggregator. In an effort to stop forced user registration at major sites like The New York Times The Baltimore Sun and The Mercury News one site is urging users to sign the Internet Advertiser Wakeup Day Petition. According to the site the petition was created by Tim Berners Lee who created the first website ever and is credited as the inventor of the world wide web. Ironically, users have to provide their names and e-mail addresses to sign the petition so it makes me wonder if the petition is legit. Tired of downloading Six Feet Under episodes using Bit Torent? Well soon you might be able to find shows and even watch them via Google. Google video search is nothing new but now Google is teaming up with TV producers including Al Gore’s upstart cable network Current to offer access to videos through Google. Yet again the former Vice President’s vision and technological forsight is evident just as when he was given the huge task of ensuring that the age of netowrked media was not hindered by government by his boss back in the early 1990s (Gore never claimed to have invented the Internet). Now I just wonder how long this Google service will be in beta. Recently at a dinner meeting one of my colleagues came back from the restroom marveling at how nice the bathroom was which prompted the rest of us at the table to take turns visiting the WC only to return and chime in our opinion (I was underwhelmed). Bathroom decor critique (BDC) is a standard activity in New York and it seems restaurants and bars are fighting to come up with the coolest new bathroom design In the late 90s Bar 89 was the rage with their unisex self-fogging glass doors and more recently SEA in Williamsburgh with their pod-rooms surrounded by beaded curtains. While all this bathroom gawking can be fun I’m usually happier than a pig in mud if I can just get my hands clean (please refill the soap, thank you very much!) and completely dry after visiting a public bathroom. Unlike Donald Trump who reportedly won’t shake hands with people because he’s OCD about cleanliness, I tend to think that the one place where you should be able to get your hands super clean and super dry is after visiting a public restroom. Well, I think I found the solution to at least half of the problem- getting really super dry hands. Forget about empty or jammed paper towel holders, forget about all those useless hand dryers that either don’t work or just blow the water down your sleeve, I recently got the chance to try out an XLerator hand dryer while visiting the restroom at The Coffee Shop in New York’s Union Square. The Xlerator hand dryer in the by Excel Dryer might just be the most powerful and effective way to dry hands in a public restroom that I’ve ever seen. 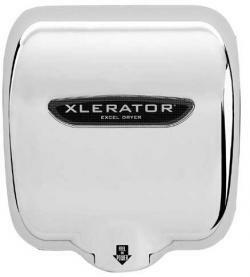 Excel claims the XLerator dries hands in just over 10 seconds (it really does!). Maybe this is because its air velocity is 14,000 linear feet per minute (LFM) but I know is that it got my hands dry and got them dry fast. Now all we need is a way to get out of the bathroom without touching that gross door handle! By now many of you surely have watched or at least heard about Googlezon, the Orwellian tale of the impact of new media or more specifically networked media on the news in by the year 2014. In writing his seminal “The Medium is the Message” Marshall McLuhan asks us to not get blinded by the content but to also pay attention to the form of the medium in which the content is contained. He asks us to be aware that a media are extensions of ourselves and that they do not exist in a vacuum but are influenced by and a product of society. In other words the folks that created the Googlezon scenario are doing exactly what McLuhan had hoped we would do. By questioning and imagining the possibility we are moving ahead of what has happened and can anticipate the change and deflect or control its impact in order to stop something like Googlezon if it’s perceived to be detrimental to society. The question now is do we preceive it as detrimental and if so will anyone actually heed the efforts to deflect the damage? Media Mogul Barry Diller’s IAC has agreed to buy the Ask Jeeves search engine for 1.85 billion dollars in a stock trade. IAC owns an extensive list of interactive propertiles including the Home Shopping Network, travel giant Expedia, CitySearch, and dating site Match.com. This heats up the already very hot search engine war between the big three MSN, Google, and Yahoo not to mention Amazon’s A9 and other engines. In a statment released by IAC it’s clear Diller is taking aim directly at the other engines but most especially barking directly up Google’s tree. For quite some time it’s been clear from the Google mission and their acquisitions, tools and services that they see their role extending far beyond traditional search and web-based technology to the more general information accessibility. In fact the Google mission which is “to organize the world’s information and make it universally accessible and useful” is simultaneously focused and broad allowing them to adapt to changes and developments in technology and the environment while still reaming true to their objective. Ask Jeeve’s which previously purchased TEOMA and recently purchased blog aggregator Bloglines is Cleary preparing to do battle. How the new search engine war will pan out remains to be seen but it’s clear that the race is on and getting more complicated every day. For several months I’ve noticed changes in website rankings on Google and it was clear something had changed in their algorithm. 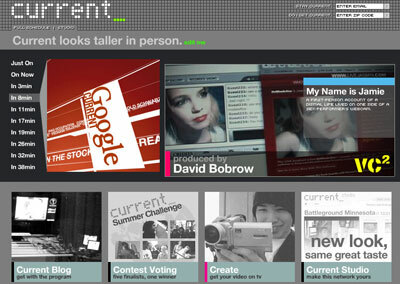 The Google change has been a major topic among internet and search engine professionals. Google regularly updates their algorithm and each time they do you can be sure to find a great deal of discussion and speculation over the change. A quick review of major search engine sites, forums and publications like Search Engine Watch will give you a little insight into what might be happening. One of the most important changes is the likelihood that Google is now giving more weight to Latent Semantic Indexing (LSI). This should come as no surprise considering Google purchased Applied Semantics in April 2003 and has reportedly been serving up their AdSense ads using latent semantic indexing. One key benefit to LSI in the field of document retrieval is that you wouldn’t have to search using the exact same key word(s) associated with a document to retrieve it but synonyms would work as well. If you’re interested in more details check out thelist of LSI sources on Search Engine Watch .